9 October 2015 by Q. Why do we use ICM In Tournament Poker? The ICM poker term stands for the Independent Chip Model. In poker ICM allows you to convert tournament players stacks in chips into their money equity (as percentage of total or remaining prize pool). ICM can be used to perform fair chops on the final table of a multi-table poker tournament or to compare the monetary values of making different decisions within a game. In essence poker ICM is the function of just two input parameters: a list of payouts and a list of the chip-stacks within the tournament, and it ignores things like skill advantages, position, and the size of the blinds. ICM uses this information of the payout list and the list of chip stacks to output a list of corresponding dollar values for each stack which are representative of their equity share of the remaining prize pool. Poker ICM equity can be easy to understand in the context of a final table chop—it would allow each player to figure out what part of the prize pool goes in their pocket if the tournament had concluded at that moment with no further play, and that amount should be the same, on average, if the tournament played out to the end. 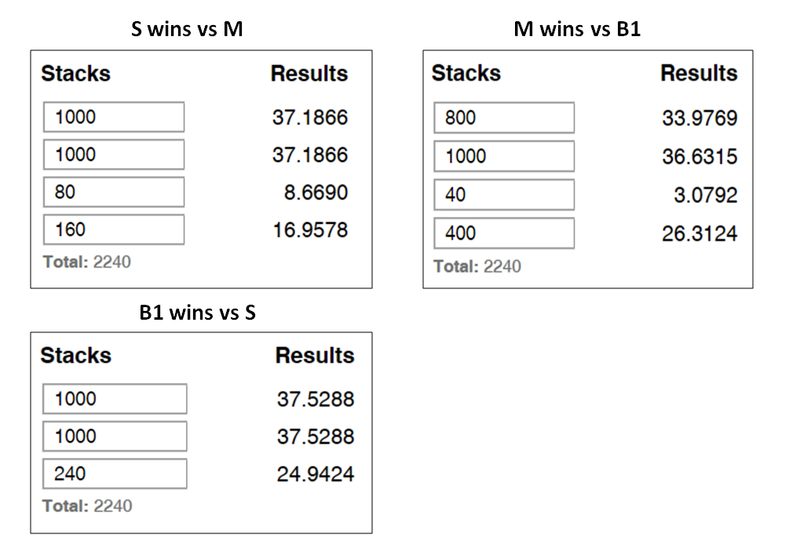 There exist various poker ICM models which differ from each other by their approach to calculating the probabilities of each stack finishing at each potential position. The most popular and proven ICM poker model that is generally considered as the ICM poker model is the Malmuth-Harville model. 3 players enter a tournament with a $100 buy-in (ignoring the rake), they each get 100 chips at 5/10 blinds, and play for a prize pool of $300 split $195 for 1st place, $105 for 2nd, and $0 for 3rd. In the first hand Player 1 folds the button, Players 2 shoves all-in, Player 3 calls, loses the hand, and is out of the tournament. Before the game each player paid $100 for their 100 chips, and all things being equal, obviously has an equal 1/3rd chance to finish in any of the 3 positions. You might think that those 100 chip stacks are worth $100 and by that logic each 1 chip is worth $1, but let’s think about what happened here. Player 3 lost his 100 chips, and the $100 he used to buy in, and Player 2 doubled his starting stack, but did he double his equity in the tournament? No. Player 2 has secured a 2nd place finish, and the $105 that goes with it, and given himself a 2:1 chip lead setting himself up as the favorite to win the match. But notice that even if he does win the entire tournament he would not have even doubled his buy-in equity of $100, as first place only pays $195 and he is still not guaranteed to win. So what happened to the remaining equity? It went to Player 1, who hadn’t won or lost a single chip but had increased his starting equity of $100 to a situation where he has locked in a minimum prize of $105 for 2nd and has at least a little more equity than that since he still has a chance to play for first. So the value of tournament chips isn’t constant, their value is tied to your ability to use those chips to win money from the tournament by finishing in the paying spots. And that depends on a lot of factors such as your relative skill over the field, the payouts, number of players, their stack sizes, positions,..., and on and on. It’s really rather complex, and it’s not possible to account for all of the factors at play to make the best decisions, so we need some way to approximate the value of our chips and chips added to and taken from our stack - this is exactly what ICM does, and it does it well. In fact it does it so well that practically all of the consistently big winning players in MTTs and Sit-and-Go’s use it to guide their play in critical situations. It has proven to be the most accurate model time and time again, and in a competitive field where millions of dollars are up for grabs, that’s saying a lot! The restrictive effect that tournament equity considerations have on a player’s range of playable hands is commonly referred to as “ICM Pressure”. As the risk of losing higher than average equity becomes greater, and proper play dictates playing tighter ranges relative to purely chipEV (like cash game) poker, a player is said to be under “high ICM pressure”. When that risk is lower, and proper ranges become closer to chipEV, the player is said to have “low ICM pressure”. The amount of pressure can be measured by the distance between the odds needed for a play to show a positive value in chips and the odds needed for a play to show a positive value in $ or ICM Equity (real monetary value). This distance is referred to as “Bubble Factor” or “ICM factor” and can be used to figure out the range of hands which can be played profitably by determining if they satisfy the ICM-Factor odds requirements against an opponent's range. To simplify, let’s ignore positions and blinds for now. In the images below we can see the exact resulting poker ICM EV’s of certain players winning or losing all-ins against each other. With 37.31% of the tournament's prize pool in expected value - players’ B1 and B2 clearly have the most equity in this tournament. However, an all-in confrontation with one another could eliminate one of them from the tournament costing them all of that equity, and because of this they need much better odds to risk their stacks against each other than they would against players S or M.
Player S, at 4.39%, has so much less equity than all the other players that he has the least to lose and the most to gain by getting into a confrontation with any player, but he would prefer to get into confrontations with M rather than B1 or B2 since when he doubles up through M he brings himself closer to being the 3rd stack than if he doubled through B1 or B2. 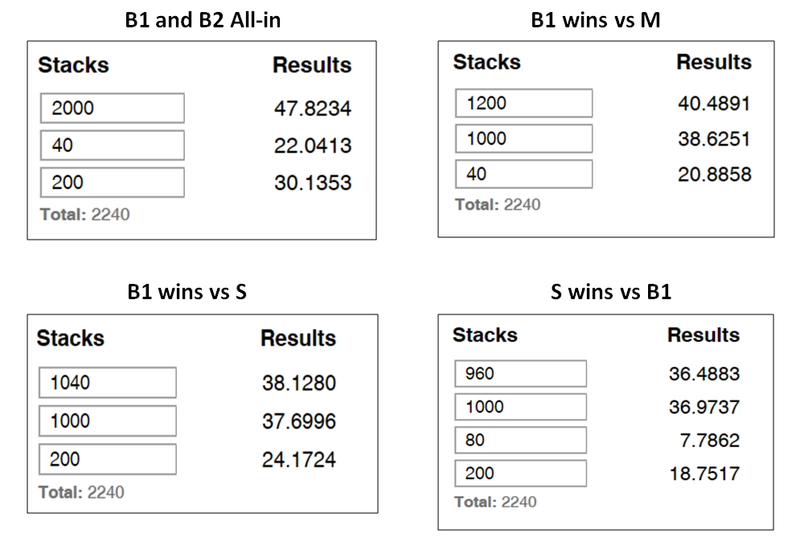 Player M is the middle stack and with 20.98% has considerably less equity than B1 or B2 but considerably more than S and so he is very unwilling to clash with one of the big stacks, where he could be eliminated when losing but still remain the 3rd stack by winning, and much more willing to clash with the shortest stack. Here we see that ICM Pressure is very high for confrontations between B1 and B2, and between M when confronting B1 or B2, and that ICM Pressure is low for B1 or B2 when confronting S or M, for M when confronting S, or for S when confronting any of the players. Now that we know about what ICM does and how to calculate it we can start using it to plan our strategies in tournaments. We do this by using the ICM equity conversion to compare the difference in expected value (“EV Diff”) of our stack between our options of folding or playing (in all of the various ways) the hands we’re dealt. 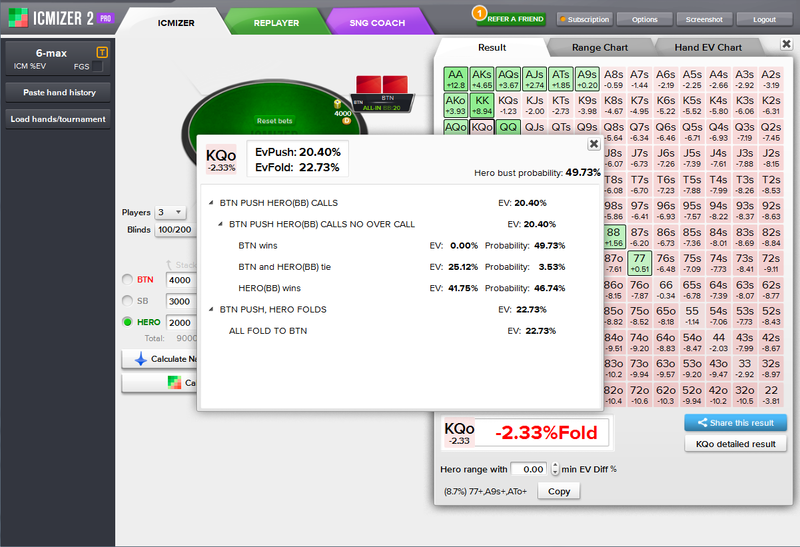 Using a basic equity calculator (or the Detailed Result view in ICMIZER) we can see that against this Button’s shoving range the Big Blind’s KQo will win 46.74% of the time, tie 3.53% of the time, and lose 49.73% of the time when he calls the all-in. A quick sidenote - If this were a cash game hand we’d simply look at our odds of calling 1,800 chips into a pot of 2,300 to see that we need 43.9% equity to profitably make the call, and clearly being over that number here we can see this is a +chipEV call, but tournament poker isn’t as easy to solve. So 46.74% of the time ending stacks will be [BTN: 2,000, SB: 2,900, BB: 4,100] and 3.53% of the time when BB and BTN tie to chop the Small Blind’s post they will be [BTN: 4,050, SB: 2,900, BB: 2,050]. The 49.73% of the time that BB loses the all-in his $EV will, obviously, be $0. We can plug all of those ending stack setups into our poker ICM calculator to see the ICM_$EV of each result, multiply those EV’s by their probability of happening, and sum those numbers up to get our overall ICM EV of calling the shove. Now that we know the EV of calling the shove with KQo we need one last bit of information to determine what our most profitable move is - do you remember what that piece of information is? Take a moment to think about it before reading on. The last crucial piece of information that we need to account for is the expected value of our fold. Without knowing the EV of fold we would have nothing to compare the EV of calling the shove against. We’ll note that if the BB folds to the Button’s shove he loses his post of 200 chips and we have an ending stack setup of [BTN: 4,300, SB: 2,900, BB: 1800] and ICM tells us that this setup gives the BB player an EV of (EV Fold: 22.73%) and we can compare that to (EV Call: 20.40%) to see that BB should clearly prefer to fold this hand as it is worth (22.73 - 20.40) = 2.33% of the prize pool more than calling, and to a less experienced player 2.33% may not sound like much but in reality this is an absolutely huge amount of equity - representing more money in one decision than the biggest winners in 1-table SnGs make in an entire game on average - let’s make sure we pick the right side of this decision as often as possible. In cash games this calculation of comparing the EV of playing a hand to the EV of folding a hand is so trivial that it’s easy to forget that we do it at all - when a cash game player is out of the blinds he just needs to outperform his $0 from folding, and when in the blinds he needs to outperform the loss of his posted blind when he folds. But, once again, we see that things aren’t so easy in tournament poker. In fact the example we used above is actually as easy as it gets in tournaments. We had to deal with just one opponent and had to take a single hand range into account. Finding our EV of fold wasn’t as simple as merely the chips posted for the big blind and rather had to be calculated using the ICM poker model, but there was only one resulting stack setup because the BB’s fold closed the action. If we were to look at the Button’s decision when comparing his EV_Push to EV_fold we would need to calculate for all of the possible ending stack setups after he folds including: SB Push / BB Call [win/tie/lose], SB Push / BB Fold, and SB Fold. And even still, that is just for calculating the simplified push/fold game, to truly calculate the real world game the button would need to consider the sum of all of the possible ending stacks even after his fold - even including when the small blind limped or raised non all-in and both of those players saw a flop, and then for every possible ending stack setup for every postflop decision. Luckily, many important situations in tournament poker actually are purely push/fold or are close enough that push/fold models will still be very valuable - but my point in writing this is to say that tournament poker ICM considerations don’t stop at push/call decisions, they always exist, after a fold and even in post-flop play so a player should make great effort to always be aware of its effect when making decisions. ICM is a wonderful model, but it isn’t perfect. Before we conclude this article let’s talk about the shortcomings of the poker ICM model. Solving the true EV’s of any play in a poker tournament would require knowledge of how every possible hand in the tournament from this point until every possible conclusion would play out for all of the remaining players. This is clearly far too complex for there to be any hope to model in any but the most incredibly elementary situations, so we turn to models which simplify the game and that is exactly what ICM does. As a model in poker ICM simplifies the impossibly complex real world game into a much simpler game, a game where everything stops and every player is simply paid, right now, his share of the tournament prize pool based entirely on his and every other player's stack size. ICM ignores important things like skill, position, blinds, or really any poker actually being played. So ICM doesn’t consider that the UTG player will be posting a big blind next hand, or that blinds are going up in 2 hands - in fact ICM doesn’t even know that there are blinds in this game at all! ICM doesn’t know that the player in seat 2 is tilting, player in seat 5 is sitting out, or that you are, obviously, the best player in the world on a table full of donks and fish. ICM simply gives us a model to estimate the value of a stack of chips, and then we use those estimated values to compare the different plays we can choose from by modeling a real hand of poker, accounting for blinds and skill (ranges chosen) for that one hand. But at the end of that model for that one hand, once again, ICM assumes that everything stops and all players are immediately paid their ICM equity of the prize pool and all of the information that exists in the real world (skill, rotating and increasing blinds, etc) is ignored. Let’s take a look at one last hand example, an extreme yet common case on the bubble of a 6max SnG - where the SB is considering a shove into the chip-leading BB, while the short stack button player has only one blind left - to see how a single poker hand modeled with ICM suffers from the ignorance of rotating blinds. To speed things up we won’t be doing any work by hand here, we’ll just look at the results of an ICMIZER calculation and assume a Nash Equilibrium calling range for the big blind. At equilibrium in this push/fold game modeled with ICM, the BTN should be pushing just 6.2% hands and SB who is medium stack should shove roughly 10% of the time. Certainly there is merit to the BTN folding some hands—there is a chance that if he folds SB and BB will go all-in against each other and that would be a great outcome for the button player. However, ICM suggests only 6.2% push which may sound strange to a player with some poker intuiton, so we need to think about what ICM takes into account and what it actually ignores here. It becomes immediately apparent that there is a big flaw that requires an obvious adjustment. ICM assumes that, at the end of the hand, all things are equal and everyone gets paid their ICM equity share of the prize pool. 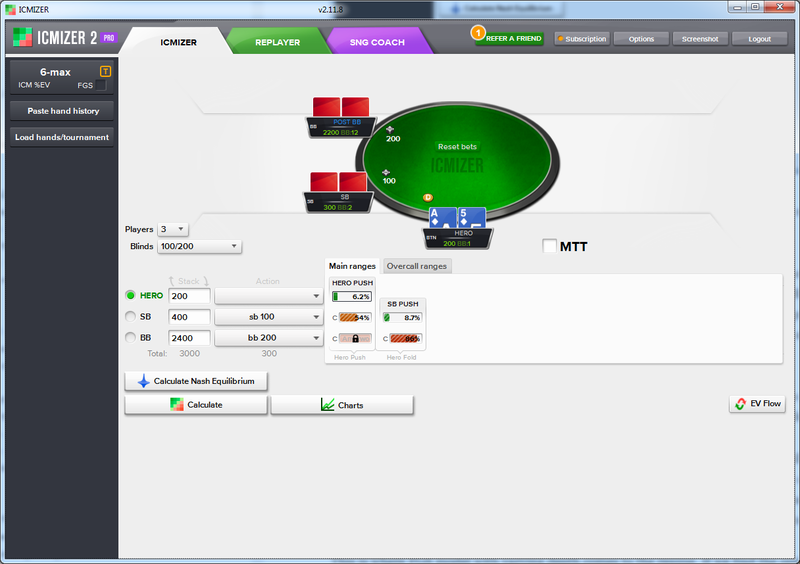 So in this example it assumes that the BTN is going to get paid at the end of this hand based on his 200 chip stack. But all things aren’t equal, and we know that in the next hand that BTN short stack will have to post his blind all-in with any hand he is dealt, clearly this event is much worse for the short stack than the naive assumption that he’ll be awarded his equity next hand - and that loss for the short stack is a gain for the others. This issue is always present with ICM calculations, although at deeper stacks and further away from the bubble it’s effects are lessened. We can se that the pushing range has increased significantly, now to 28% percent which represents the following hands: 44+,A2s+,A3o+,K6s+,K9o+,Q9s+,QTo+,J9s+. It also makes much more sense intuitively. We’ve just shown that ICM has some flaws but it still is the Mother of the tournament hand analysis. Virtually every winning professional SnG and MTT player at any stakes uses ICM to analyze their play and help craft their strategies for the tables, clearly ICM is the superior model when compared to Chip EV estimations of the tournament equity. There have been successful attempts to improve ICM’s accuracy by addressing the flaws we mentioned here. The model that is currently trusted by poker professionals is Future Game Simulation (FGS) which uses ICM at it’s core and takes the method we used in this article of modeling a poker hand a step (or several steps) deeper by modeling a number of hands which will follow the current one. This model effectively accounts for issues like order of posting the blinds or short stacks at the table. 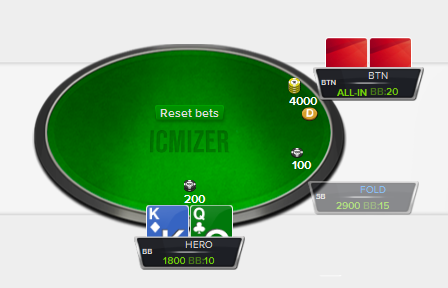 With ICMIZER you can review any tournament hand with ease. The most powerful software & mathematical tools are at your disposal: FGS & ICM models, Nash equilibrium approximations and precise equity calculations guarantee powerful strategies and minimize the amount of mistakes that you will make at the table. You are welcome to like and share this article if you learned something new about ICM poker model!